Citation Information: J Clin Invest. 2007;117(12):3971-3978. https://doi.org/10.1172/JCI28493. Maternal smoking during pregnancy is associated with a variety of adverse neonatal outcomes including altered reproductive performance. Herein we provide molecular evidence for a pathway involved in the elimination of the female germline due to prepregnancy and/or lactational exposure to polycyclic aromatic hydrocarbons (PAHs), environmental toxicants found in cigarette smoke. 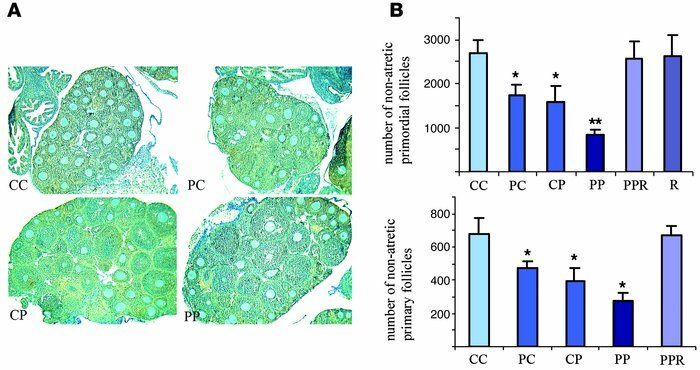 We show that ovaries of offspring born to mice exposed to PAHs contained only a third of the ovarian follicle pool compared with offspring of unexposed female mice. Activation of the cell death pathway in immature follicles of exposed females was mediated by the aryl hydrocarbon receptor (Ahr), as ovarian reserve was fully rescued by maternal cotreatment with the Ahr antagonist, resveratrol, or by inactivation of the Ahr gene. Furthermore, in response to PAHs, Ahr-mediated activation of the harakiri, BCL2 interacting protein (contains only BH3 domain), was necessary for execution of cell death. This pathway appeared to be conserved between mouse and human, as xenotransplanted human ovarian cortex exposed to PAHs responded by activation of the identical cell death cascade. Our data indicate that maternal exposure to PAHs prior to pregnancy and/or during lactation compromises ovarian reserve of female offspring, raising the concern about the transgenerational impact of maternal smoking on ovarian function in the human. Effect of maternal treatment with PAHs on the ovarian follicle endowment in female offspring. (A) Morphological appearance of ovaries from 3-week-old female daughters of mothers exposed to vehicle only (CC), PAH exposure (cumulative dose of 6 mg/kg) before pregnancy (PC), PAH exposure (cumulative dose of 6 mg/kg) during lactation (CP), and PAH exposure (cumulative dose of 12 mg/kg) both before pregnancy and during lactation exposure (PP). (B) Quantitative representation of the morphometric analysis of the ovarian pool for nonapoptotic oocyte-containing primordial (resting) and primary (growing) follicles in different treatment groups is expressed as mean ± SEM. Each treatment group shown represents combined data obtained from at least 2 female offspring per litter from each treated mother: CC, n = 11; PC, n = 18; CP, n = 11; PP, n = 15. Effectiveness of AHR antagonist was assessed in mothers from the PP group supplemented with resveratrol (PPR), or mothers from the CC group (vehicle) supplemented with resveratrol (R) (cumulative dose of 120 mg/kg). Two to three females per litter from each mother were subjected to morphometric analysis (R, n = 6; PPR, n = 9). *P < 0.05 relative to control; **P < 0.05 relative to all treatment groups.